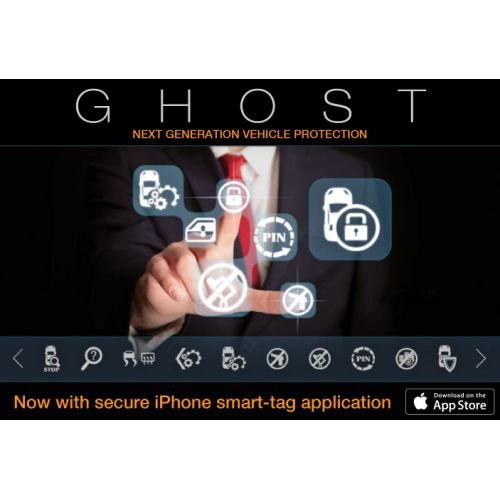 The Ghost is a unique next generation device that secures your vehicle without the need for cutting multiple wires or adding after market alarm/immobiliser key fobs. The device is connected to the vehicles CAN Data Network and a personalised PIN Code is programmed into the Ghost using a selection of the vehicles existing buttons on the dash board and steering wheel to create a unique code pattern that must be selected before the vehicle will start! The advantages of using the vehicles own CAN Data Network has several advantages, including low impact installation, very low probability of being detected and disabled, and can be fitted into the vehicle in any number of locations. Because the unit communicates with the vehicles ECU on the CAN Data circuit, it is totally silent so it does not give away its location. Stops Key Cloning and ECU Swapping. A thief cannot now simply add a new key or replace the ECU to steal your vehicle as only the correct data inputted will allow your vehicle to start. Due to the nature of CAN Data Ghost has been adapted and tested for every vehicle that we list as compatible. Weatherproof tiny device. The Ghost is sealed and so small it can be installed and wrapped into the vehicle harness virtually anywhere making it virtually impossible for a thief to find. At any time you can choose a unique different PIN Code configuration. The buttons in modern vehicles send data all a round the vehicle which allows the Ghost to respond to your specific inputs via the CAN Data without the need to add extra wiring.